Finding beauty and creativity in our daily lives is vital for happiness. Art is a path along which the breadcrumbs leading us to both are found. This statement seems pretentious in a society cutting the study of art (music, dance, literature, painting, and drawing) from its educational system, regarding it no more necessary than so much fat sucked away through liposuction. Access to art is also eroding: on a recent trip, my husband and I paid $15 each for admittance to an art museum. Without funding, art, like health care, may soon be accessible to a decreasing number of people. Art is essential in bringing beauty and creativity to nursing practice because it provides the humanitarian tools needed to find self-worth in a job that is complex, and often overwhelming, with waves of life and death crashing over our heads. It’s easier to empty a bedpan if you consider Prometheus and his love of humanity while you clean. 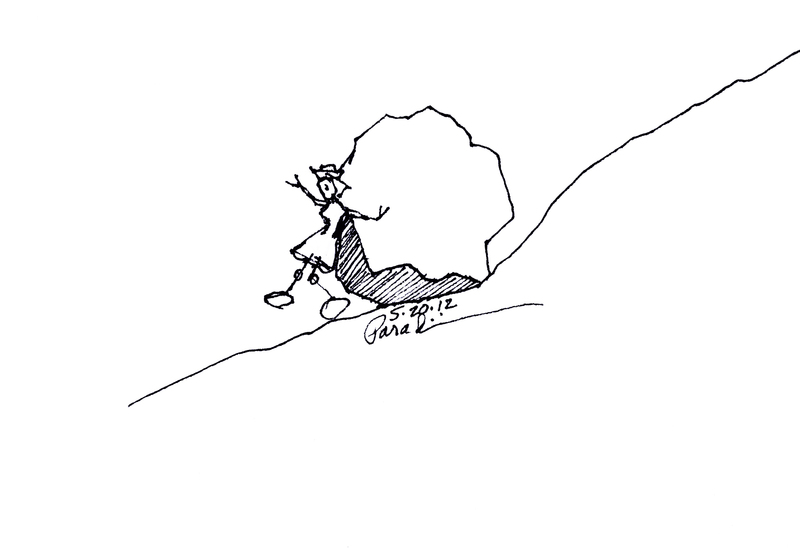 For other nursing tasks, the punishment of futility dealt to Sisyphus perhaps comes to mind more often. The longevity of Shakespeare’s plays speaks to their grasp of human psychology and motivation. Art and literature provide archetypes we can apply to our modern lives. Excluding the arts from a life science curriculum leaves us searching for meaning without a compass. The ability to apply meaningful ideas from art and literature to our daily lives promotes sustainable happiness. This entry was posted in Posts About Art & Nursing and tagged Art, art and nursing, art in education, burnout prevention, medical humanities, nurse blogs, rn blog by jparadisirn. Bookmark the permalink. Thanks for sharing, Samantha. I’ll check out both sites. Cheers! Thank you for this posting. I come from the patient side and I knew that this must be true for health care providers, but I haven’t found many providers who are out there talking about it. You might want to take a look at this speech by Arlaina Tibensky about the power of literature. She makes a wonderful statement about the importance of literature (another form of art). I am delighted to have stumbled upon your work. I find your art very compelling – as is your story. I moderate a blog called Ultra Sounds (http://ultra-sounds.org/): An Online Form for creative exploration of the cancer experience. We accept submissions for creative works by people who are cancer patients or who are connected to or support cancer patients. We accept writing, art, photos, cartoons and videos. If you look at the site, you can click on the link to Ultra Sounds Mondays to see previous submissions. There are some wonderful creative works there. Perhaps you would consider submitting. I will definitely share your blog on the site.